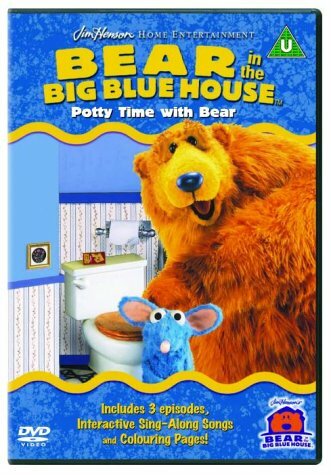 Children can learn all about toilet training and other important issues with Channel 5's favourite seven-foot bear and his colourful muppet friends in Bear in the Big Blue House--Potty Time with Bear. Produced by the Jim Henson Company, this crystal-clear DVD contains three fun-packed 24-minute episodes aimed at two to five year olds. The first episode "When You've Got To Go" was originally broadcast on the Disney Channel in 1999 to rave reviews. It deals sensitively with the subject of toilet training, with Bear gently guiding his friends through all the fears raised by using the potty or toilet. Many topics are covered including good hygiene, respect for privacy, recognising the call of nature, accidents and the importance of seeing toilet use as a natural part of growing up. The growing-up process is reinforced in the second episode with Bear encouraging Ojo the bear cub to practise adult behaviour, and the third episode slows everything down, emphasising the necessity of a good night's sleep. Bear is the perfect host throughout, drawing viewers into his world by sniffing up close to the camera and claiming he can smell his scrumptious young audience. He is kind, patient and gentle to his friends, making him an ideal carer and teacher. Upbeat songs reiterate the main themes. Many are funny and complement the two regular favourites "Welcome to the Blue House" and "The Goodbye Song". Fans and newcomers will be thrilled by this DVD--Bear and his friends make even the difficult parts of growing-up a lot of fun! --Tracey Hogan.